Armory Athletics are home to over 120 Competitive Athletes. 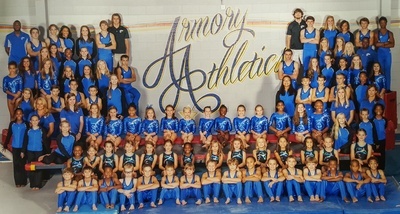 USAG levels 2-10, Boys and Girls.The Armory have been top competitors in the area for over 30 years. Along with numerous TEAM wins, athletes qualifying for State, Regional and National competitions are just a few of our highlights. The USASF All-Star Cheer Competitive Team will be evaluated annually according to participant interest. Anyone interested in the gymnastics competitive teams or cheer prep program must be evaluated for proper placement by a coach. Please see the office to schedule an evaluation for your child.